Hello Helloooo there everybadehhhh ! 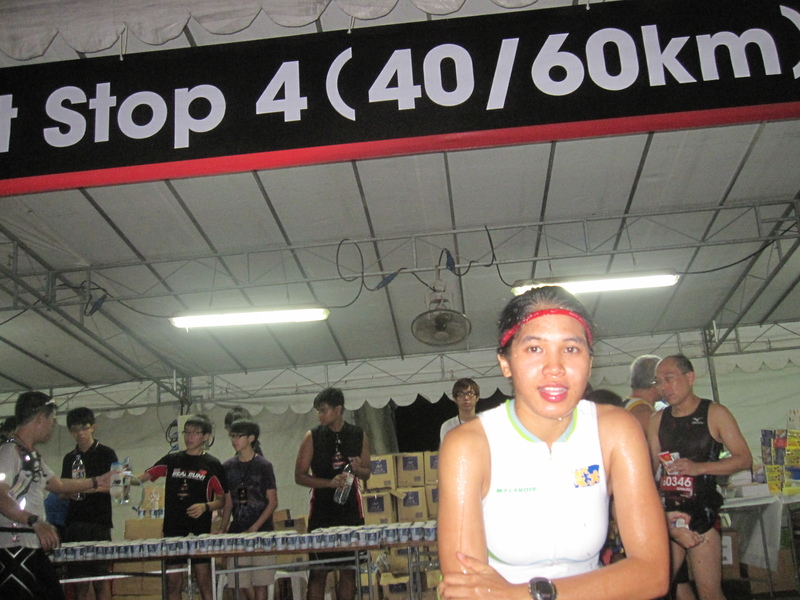 I am back from Sundown Ultra Marathon in 1 piece. In fact I was back in KL on Sunday after the race and back to work on Monday . Its Thursday already and I don’t want my 100km journey to expire on the stale bread rack. So here’s the low down. I ran a freaking 100km – my maiden road ultra-marathon last Saturday (and Sunday) in Singapore. Start and end venue was at Marina Barrage. A beautiful reservoir which surrounding is bustling with various activities i.e. rowing, construction, etc. The ultra journey started on Thursday when I decided to take leave – physio appointment, had to pick up jersey from printer and pack for Singapore. Left KL on Friday morning – a good idea as I know I would tire myself out if I flew in on Saturday. I had started carbo-loading 4-5 days before the event *or should I say a week ?! * so the nutrition part was not an issue I was really concerned about. But for the race itself, I made a thorough nutrition analysis of what should be taken, and when. Come Saturday, I was all excited already. Slowly packed my barang-barang (meaning things) into separate bags – a) special need bag supplied by the organizer. this bag is to be placed at the 50km pit stop. b) my pre/post-race bag (my change of clothes, slipper etc) c) race gears – all the things i need during the race/race start i.e. Vaseline, Salonpas spray, FuelBelt etc. – yes, my phone was part of my race gear as well ! Took a cab to the start line which was 6km away. No way I was going to walk/run to Marina Barrage with all my stuff, though I know that my ultra/IM friend mr Paul Lee did walk/run to the start line. I reached Marina Barrage at 5pm. Race starts at 6pm. The next time if I am going to do this event – i have to make sure i reach the event venue earlier — give me buffer time to relax and sort myself out before the start ! It was hot and sunny. Plenty of people walking about, runners catching up, yadda yadda.. and it wasn’t long before the MC announced runners are all welcome to go to the start line. I wasn’t thinking of anything..just the excitement of starting the journey. I know its not one of those events where I can ‘relax’ sebelum race..
We were flagged of exactly at 6pm. I saw Naidu, Fathi Junaidi of Brunei, Adeline Lee my IM buddy, Agnes Yes, adik Victor !, Karen Ang, Farid Elias and many more. My target is to run a reasonable pace –> that means slow pace lah that can last me the century run, and to stop every 10km for a sip of drink or cool myself down. 50km will be the stop for a longer breather, change socks etc. I plan to do it 10km at a time, and not to get too overwhelmed with the fact that I WILL finish what I came here for. 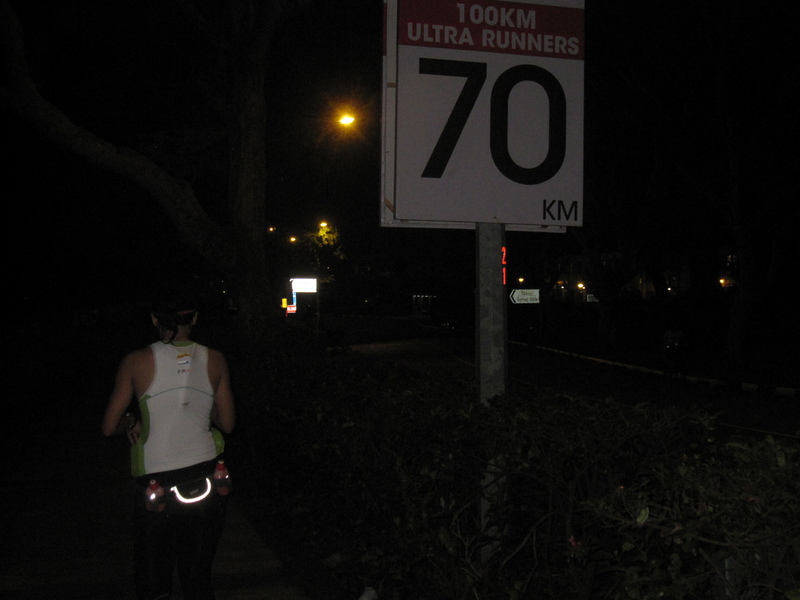 I was asked many times what is my target for the Sundown Ultra Marathon. The ultimate aim (as this is my first time) is to finish the race within cut-off without no injuries. I did not rely on gps, Garmin or any foot pod to pace myself – I didn’t use these gadgets for my training. I let my leg do the work and pacing. My split timing was done every 10km. I guess I did okay for the first 50km, making it before the cut off. Take a look at the table below. Will explain further after this. Planned – 1hr 20mins. Actual time – 1hr 13mins (+7mins). It was still broad day light. Sunny Singapore – Should have braced the sunlight more. The first 10km was a breeze, as breezy as the wind blowing from the sea. Made sure I didn’t follow others’ pace. Rayzeef overtook me as I was nearing the first water stop. 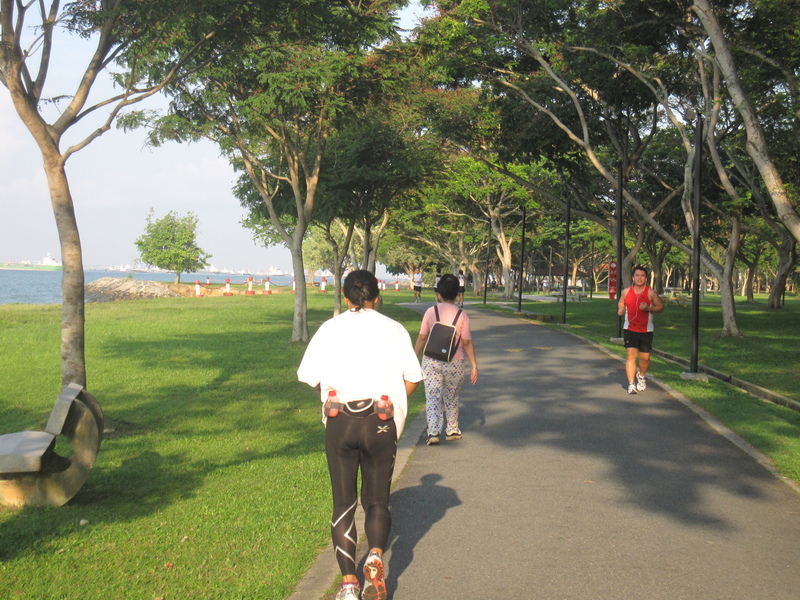 East Coast Park was bustling with activities. Nice. Planned – 2hr 40mins. Actual time – 2hrs 21mins (+19mins). Started to get dark after the 10km mark, and darker as I run towards the 20km mark. My first loo stop was somewhere between the 10km and 20km mark. Remember to go to the loo every time you need to or you’ll end up wasting more energy for that sphincter ! Lucky thing there were plenty of public toilets around the route. And they were generally much cleaner than uhm, the ones we have here in Malaysia. Most importantly these public toilets are not locked ! Free some more! I started recording my time for every 2km at the 14km point. There were markers every 2km at Sundown Ultra. 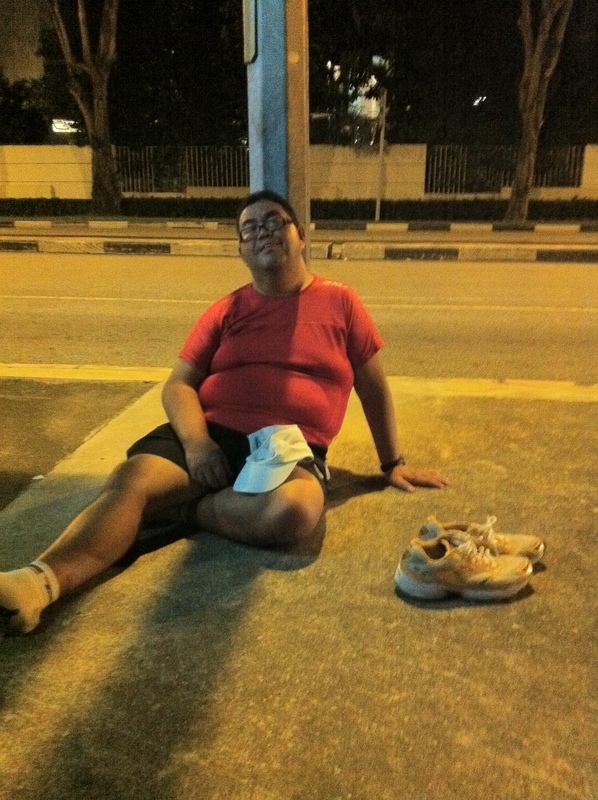 Resting at the 30km mark. Revising biochemistry notes? haha.. no lah ! Reached the 30km water station on time, well almost. Rested around 6mins , laid down and checked out my nutrition table. Powerbar Performance gel – every 10km. Salt table every hour. Did not feel tired at the 30km point as I was running at a slow pace. Saw many people at the 30km point. Another 20km before the half-way point. 6 minutes up, and off I went ! From the 30km to 40km point :- A lot of supporters at the street sides, bus stops and junctions. Good enough to lift up the near midnight mood. I didn’t feel sleep. A good sign. In fact a lady commented ( I heard) that I still look fresh. I understood that I am not even at the 50km mark YET, and that the ball starts rolling on after that 50km point. Reached the 40km point quarter to midnight. I was still high in spirit, there was no pain anywhere on the muscles and joints, yet I am still anticipating them. ‘They’ will come anytime. Not that I am asking. I just gotta be ready. Planned – 8hrs. Actual time – 7hrs 21mins (+39mins). Rest time : 24mins. I reached the 50km point around 1.30am in the morning. Quickly swallowed a caffeine table to make sure I don’t sleep walk even though sure kena zombie punya. I took my time to go to the loo, grab a banana, some solid to makan, 1/2 of the Powerbar Performance bar. I laid down on the, lifted my legs, tried to ease myself. It has been 7 hours plus of running and I better get a grip of myself to face the next 50km. I wasn’t thinking of anything else but to continue the run as planned. Well, not that my plans are carefully laid out. Just general pointers to keep my head objective. I even brought my foam roller ( I put in the special need bag) but tak guna pon. All are there for standby. All the sumi jelly and chocolate tak makan pon as my gaster bag and g.i. are pack already. I had to force myself to makan(eat) some bread. Tu pon nak telan sedikit punya payah (meaning hard to swallow). I continued my journey feeling fresh. I saw Kash and another pakcik(uncle/elderly man) on the other side heading to the 50km point as I journeyed on to the next water station. I saw 2 guys laughing to the fact that they are slower than the pakcik ahead of them. I know there are plenty more pakcik and makcik ahead of me. In any endurance race its not about who’s younger and fitter. It’s about how well you can adapt to the racing condition and maintain that mental strength throughout. Planning your breaks well is important too (later I learned !). The journey to 60km was interesting as much as it began to feel as though the 2km gap between the markers have stretched further and further. I think my mistake started right here en route to 60km. As you can see above the ‘+15mins’ meaning I reached the 60km point 15mins faster than planned. I should and could have slowed down a little bit more. The first 50km was ran. The next 50km I planned to run and walk. I time a 3mins:1 mins walk:run kinda routine. There was no way I can run all the way ! Not this time, especially Sundown Ultra 2011 being my first real ultra event. Anyways..I continued recording my time every 2km. Planned – 11hrs. Actual time – 11hrs 4mins (-4mins). hamstring was so tight I couldn’t extend my right leg. But it wasn’t severe. 70km done. 30 to go. Cold? Hot? It was cold in there !!! Yes, hypothermia. There was nothing much I can do as there was no where I can grab a hot drink, or warm blanket. I reached the 80km mark around 6.30am and around 82km the sun was already up as I passed a park. It was sunny alright, but I didn’t feel the heat. In fact I was shivering. I told myself, this cannot continue as I am only endangering myself – I quickly asked for my supporter’s t-shirt. I wore it over my Zoot tri-top and picked up the pace. Even with a double layer, I still felt cold every time the morning sea breeze blew. Gila ahhh ! So there, a new learning experience for me. It wasn’t on my check list nor was it on my caution list – what’s worst to expect. Oh yes, the cut off to 90km mark is 16hours. It was a good thing Mohan Marathon passed me near the 80km point asking me to get my focus back. Yeah, with my mental condition which was not physiologically normal due to the decreased core temperature – I had to get that kind of support. Passing the 90km point was such a joy. And I know, like for sure, the next 10km will be the longest journey I will be taking. My last 10km journey started at 9.28am, and hour and a half behind ‘schedule’. I wasn’t complaining. I just had to make sure I meet the cut off. I just needed a little push. I didn’t see many people between the 90km-95km mark along East Coast Park. I am sure those behind me are close behind, and those ahead of me are running strong, and maintaining it that way. I was walking and running where and when I can. After the East Coast Park stretch, we had to cross the road, go down the subway, up the pedestrian bridge, down the stairs, pass the reservoir.. dayemm.. I was getting slower and slower even though my body temperature had risen a bit. It was getting hotter and sunnier as more and more people started to overtake me. What was my pace like ? Let me check kat my phone..kejap….hahaha…just had a good laugh to myself..memang slow.. 90km-92km = 22mins, 94km-96km = 29mins (mak aiiih).., 96km-98km= 27mins, 98km-100km (including ambil 3mins ambil gambar stop)= 31mins. I must say between the 96km to 98km, sooo many people overtook me. At the 98km I stopped for a couple minutes for some photos with Agnes and the gang. I kept on moving but very slow… Even the last 1km was walked. But how on earth I found the legs that last 500m is a question i can’t answer. I ran all the way cross the bridge, down the slope, then up the slope again all the way to the finish line overtaking 3-4 runners. Crossed the finishing line smiling with joy. (and in tears?!) Yes !!!! Agnes cried at the 98km mark I told her it was ‘too early’ to cry.. haha.. and everybody just laughed. Dayemmm what a journey. Previous Sundown – Done ! Amazing feat, excellent write up and great tips on target pace management. Despite the bloody conditions you made it through the finish line, Bravo! Silent bloody battle.hahhaa…garang? cait!!! hahahaa..ampun ler. tak peghasan pongg…anyways, u were consistent on the run. congrats to you jugak and thank you sentiasa kasi support masa run tuh. 🙂 dah recover dah ?! julie lu memang gila lah!!!! aku gila ye?! yg lain2 yg join tuh gila jugak la?! hahaha… yg penting aku habis race ni tanpa sebarang kecederaan. blister pon takde. alhamdulillah ! hang balik Malaysia bila ni?! TQ Chan 🙂 I appreciate your support ! very inspiring and you made 100km looks easy! TQ Diane. I have to knock-knock my head and realize it was a 100km I ran last week. I think I can imagine running another ultra after this but have to really2 prepare. the running part may take less than 18hours but the training , we gotta put lots commitment in there.. the time , etc. Thank you for the support Diane. 🙂 God Bless. I hope to finish collecting the donation by 9 July. TQ Uncle Allen 🙂 Thank you. Tahniah! !..betul2 la kau ni julie,apa pun yg penting semuanya selamat,mimang buli ba kalau kau :p.
Congrats kak julie… once again you’ve proved, impossible is nothing n you can pretty much do ANYTHING, no matter what… We all are proud of you kak, indeed !! Reading your report makes me want to go out and run 100 km also! But since I cannot (yet), buat masa ni I just donate to japan je ya. Such happy coincidence seeing you at FRIM today. Anyway, a BIG congrats on your first ultra!